The British Royal Family are always a hot topic! You won’t find a person who dislikes the “tea” about Prince William and Kate Middleton. So, the latest investigation made by the Tab unveils their days at St. Andrews. Previously, we've shown you EXCLUSIVE pics of Prince Harry’s bedroom at Eton. Want to learn how William and Kate met and how their love blossomed? The Typical Student team was so interested to learn about the royal love, we’re sharing this beautiful story with our readers. Due to the Royal Family’s arrangement with the press not to “hound William while at uni,” little is known about the beginning of William and Kate’s relationship. Allegedly, the two met each other while Kate was at Marlborough College and William studied at Eton. According to E!, the pair met in 1998 at a gathering while being in Sixth Form. During the gap year, Kate traveled to Chile and Italy and applied for St. Andrews afterward. 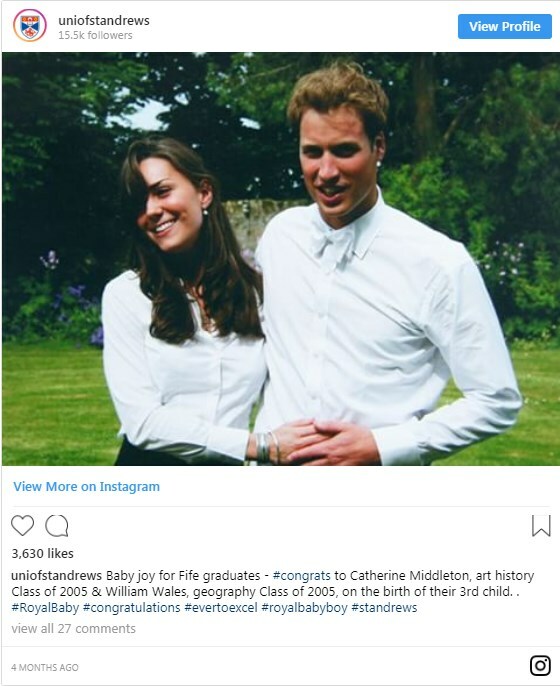 Suspiciously, her application almost matched the time of the official announcement of Prince William’s intention to attend St. Andrews the following September. And yet, according to the official version, the two met on their first day at university after being friends for more than a year. Also, they both were in St Salvator's halls, as told by Vanity Fair. The rumor has it, William was completely taken by Kate’s looks at the charity fashion show held at St. Andrews. Meanwhile, Kate allegedly couldn’t return his feelings for she was dating Rupert Finch, a fourth-year student at the time. What Were Kate and William’s Hobbies at Uni? William is known for following the family tradition of playing polo. He also "indulged" in Swahili, which turned out to be harder than he had expected. It is also known that young prince liked R’n’B so much, his friends were annoyed with it and were constantly demanding to turn the volume down. As for Kate Middleton, she was allegedly partaking in the Lumsden Club, the all-female drinking society. The members of the society are involved in the charitable action and occasionally visit a champagne reception. Later on, in the second year of university, it came to light that Kate and William moved in together with two other friends and started spending more time together. Still, only the closest friends knew about their romance, as they took plenty of precaution. Even if they would go out together they would "turn up separately." Also, they preferred holding dinner parties in their shared apartment to avoid putting their relationship into the spotlight. For sure, the relationship between William and Kate has been quite tumultuous, as the couple had to survive a temporary break-up. According to Cambridge News, William felt "claustrophobic" in the relationship. However, after a brief break-up, they reunited. As told by the Tab, when Kate Middleton eventually becomes Queen, she will be the "most highly educated Queen in the history of the British Monarchy."